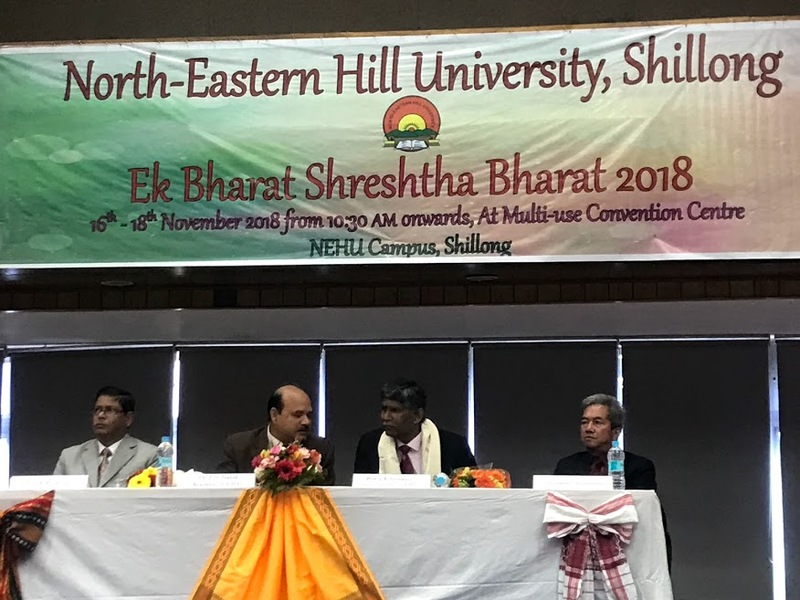 As per the guidelines from the Ministry of Human Resources to promote national integration and develop excellence in different fields, the North-Eastern Hill University kicked off the Ek Bharat Shreshtha Bharat programme with an inaugural ceremony on November 16, 2018 at the Multi-Use Convention Hall in the presence of the Vice-Chancellor, Registrar and other dignitaries. In his welcome address, Dr. J.N. Nayak, Registrar, NEHU welcomed the participating Universities such as the Banaras Hindu University, Varanasi and the Rajiv Gandhi University, Arunachal Pradesh to NEHU. He informed that the pairing with BHU and RGU was done as an initiative by the Central government to promote national integration. Giving a short introduction on Ek Bharat Shreshtha Bharat programme, Prof. R. K. Satpathy, Organising Secretary said that the programme based on Sardar Vallabhbhai Patel’s dream of one India, was started on 31st October 2015 by the Prime Minister of India, Mr. Narendra Modi and will culminate in the year 2022. He further informed that the Ministry of Human Resource Development (MHRD), which is the nodal agency for this initiative, has created 16 pairings of higher educational institutions and identified 27 areas in which the activities can be conducted. The inauguration ended with a vote of thanks by Prof. Desmond L. Kharmawphlang. The two-day programme consisted of two components: academic and cultural. For the interaction in the academic programme on November 16 and 17, Prof. Dhananjay Singh from JNU and Dr. Sajjan Kumar from NMML, Tin MurtiBhavan, New Delhi led the discussion. On November 16, the topic for interaction was ‘Youth and their Worldviews’ and the next day it was ‘Today’s Youth and Tradition, Culture and Modernisation Process’. The afternoon sessions had cultural component in which participants from three universities made various traditional as well as modern dance, music and costume presentations.